Transit-Oriented Development (TOD) refers to the investment that takes place at and around transit infrastructure. TOD is often a catalyst for economic growth – improving access to jobs, housing and amenities, and helping promote active lifestyles and a reduced dependence on automobiles. The Delmar Loop has long been a success story in the region for offering vibrant, around the clock activity. However, for many years that activity didn’t extend down to the far eastern end of Delmar Boulevard. That’s about to change. Maxine Clark, founder of Build-A-Bear Workshop and CEO of the Clark-Fox Foundation, recently announced plans to renovate the former St. Luke’s Hospital building on Delmar as part of the Delmar DivINe project. The name intends to provoke a different take on Delmar Boulevard, what is often seen as a dividing line in St. Louis. Delmar DivINe is designed to be a space for innovation, collaboration and community. 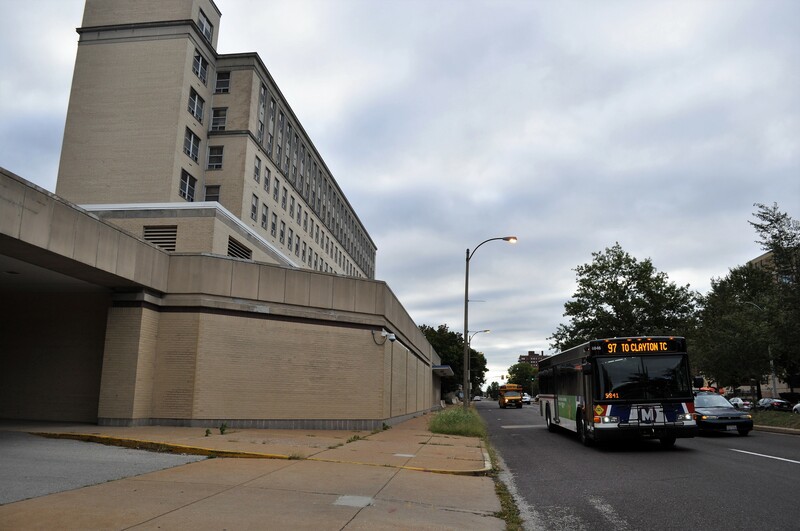 The project will renovate the former hospital building between Clara and Belt Avenues on Delmar, on the eastern edge of the West End neighborhood, and will include access to public transit. Some sections of the hospital structure were first built in 1904, and the facility was closed in 2014. The renovation will inject a 21st century modern approach to a historic asset. The 473,000-square-foot building will include 150 one and two bedroom apartments designed for young, diverse professionals at reasonable prices who value being near alternative transportation options, including Metro Transit and the Loop Trolley. The mixed-use project will also provide office space, shared services and resources for nonprofits, foundations and community support organizations. Shared spaces include an auditorium, training and conference rooms, and a resource and evaluation center. Shared space tenants may be national or local, but the intention is to find organizations that are focused on improving the lives of children and families in the metropolitan St. Louis area. Clark, the Chief Inspirator of the Delmar DivINe project, sees this investment as a benefit to the entire St. Louis region, well beyond the city limits. The nonprofit office space will take up 160,000 square feet of the building, and the ground floor will be filled with businesses to enliven the area and improve walkability and accessibility, an important design feature for transit riders, cyclists, pedestrians and other users of car-free transportation. The $90 million development is expected to create about 500 jobs in the surrounding community when completed, representing a significant investment in the economic development of the area. Developer: Clayco Construction and the Delmar DivINe Corporation. Timeline: Construction on Phase 1 is set to begin in December with planned completion in spring of 2020. A completion date for Phase 2 has yet to be determined.